The integrated doorset concept brings together products developed by Leaderflush Shapland using the extensive insight and understanding it has gained working with the health sector for many years. This enables Leaderflush Shapland’s skilled staff to work closely with specifiers, contractors and architects to identify which products are right for their project. As part of Great Ormond Street Hospital’s £343 redevelopment, for instance, 756 Leaderflush Shapland doorsets were specified after close consultation with the architects. This included specifying the Plasform doorset at points in the hospital where there is a high risk of infection, such as MRSA and salmonella, spreading. Its rounded postformed edges minimise the build-up of airborne particles, while all the veneered doorsets supplied incorporate Hygienilac, an antimicrobial finish that kills most species of bacteria and gives 10 years of protection. Leaderflush Shapland’s collaborative approach has also proved successful on other large projects including the refurbishments of Tameside General Hospital and Salford Royal Hospital. By sharing its knowledge with its customers Leaderflush Shapland’s staff help make sure the correct products are used for each application, as well as providing ongoing technical support at all stages of a project. 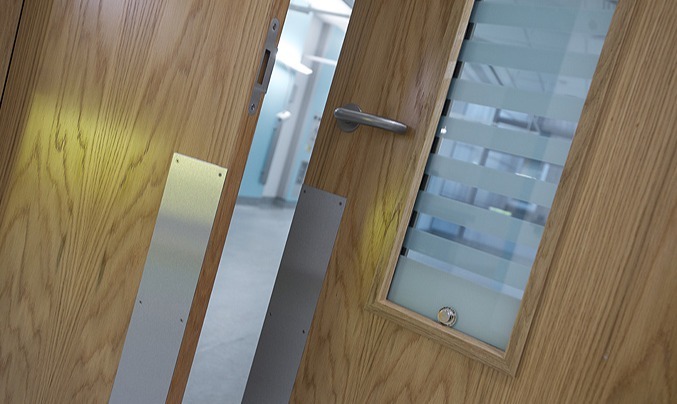 Leaderflush Shapland understands the varying demands placed on doorsets in different parts of a health sector building, which HTM 58 identifies as: heavy duty, severe duty, high security duty, fire resisting and x-ray grades. And Leaderflush Shapland’s onsite testing facility ensures its doorsets go beyond standard requirements: “We replicate what happens in the field during testing because it is really important to make sure our tests reflect the environment the product is going into,” said Steve Hutsby. This gives specifiers of doorsets the confidence that Leaderflush Shapland’s doorsets are able to cope in the toughest environments.